100 years ago surfer/photographer Alfred R. Gurrey Jr. hand made and self published the first book dedicated to Surf Riding. 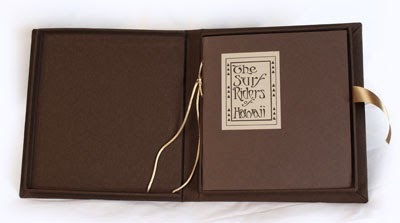 This website is dedicated to research on this book “The Surf Riders of Hawaii”. After 15 years of dedication to this project, we are proud to announce the publication of two (2) Limited Edition Publications to honor the 100 year anniversary of "The Surf Riders of Hawaii". 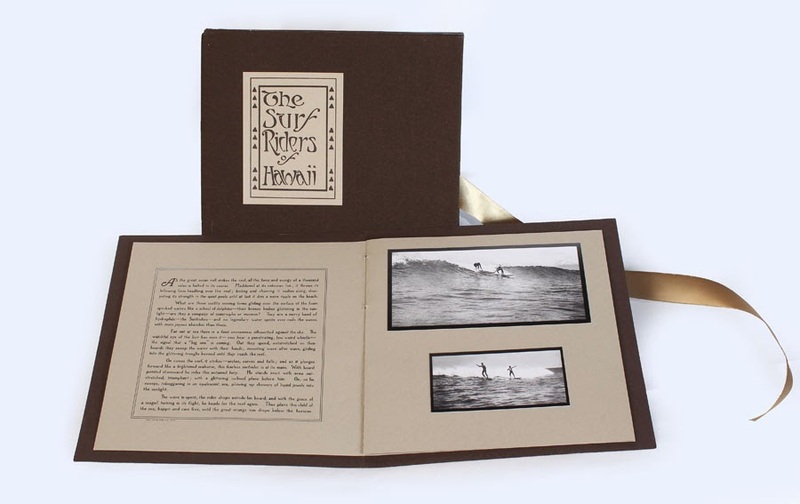 All profits from sales are being put towards distribution of editions of "The Surf Riders of Hawaii" to libraries and institutions so a new generation can hold and enjoy this time capsule from a lost era of surfing's history. Noted surfing historian, writer and Professor Patrick Moser, was kind enough to write this about the books. "Tim DeLaVega has done a masterful job restoring A.R. Gurrey’s The Surf Riders of Hawaii. It’s like opening a time capsule and experiencing our sport as Gurrey’s first readers did a hundred years ago. The textured pages and hand-crafted photographs will transport you back to turn-of-the century Honolulu. The addition of The Life and Times of A.R. Gurrey Jr. by Joel Smith and Sandy Hall is a tremendous bonus, with additional rare photographs. This fine collection belongs on the bookshelf of anyone interested in connecting with authentic surf history. A hui hou" Patrick Moser. During the 2014 Sochi Olympics, Fernando Aguerre, President of the International Surfing Association (ISA) gave a Centennial set of the "Surf Riders of Hawaii" to Thomas Bach, the President of the Olympics, to represent surfings rich past. And the International Surfing Association (ISA) is continuing this honor by giving sets to dignitaries as they travel around the world and celebrate the 50th anniversary of the ISA. "Hana Hou" the magazine of Hawaiian Airlines featured an article on A. R. Gurrey Jr. and the "The Surf Riders of Hawaii, Centennial Edition". "Dropping In" by Stu Dawrs. Click here to read the article. Sorry but this Edition is Sold Out! * Done in co-operation with the Gurrey/Bayer/Murray families. 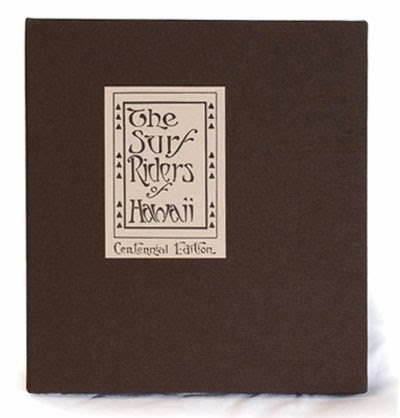 * Includes the restored "The Surf Riders of Hawaii". * Hand made to the original specifications. * All text restored to match the original craftsman style lettering. * All photos restored and printed using the "silver halide" method, as used by A.R. Gurrey Jr. in 1914. 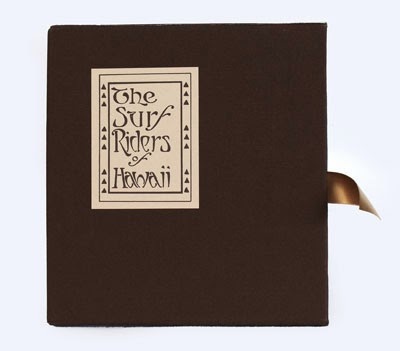 * Comes inside the "The Surf Riders of Hawaii" slip case, to protect your collectiable. 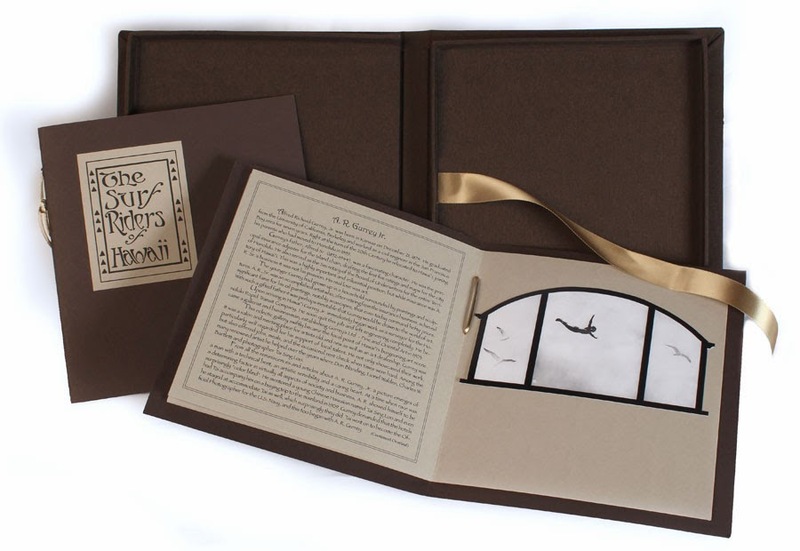 * A limited and individually numbered edition of Hand Made books from Hawaiʻi. * Includes 2 books: The restored "The Surf Riders of Hawaii" and "The Life & Times of A. R. Gurrey Jr." by Joel T. Smith & Sandra K. Hall, with new information on Gurrey. Including five restored photos by A. R. Gurrey Jr., including "The Duke Diving, shown above." * Comes inside the "Centennial Edition" presentation box, to protect your collectiable. * Limited and individually numbered edition of Hand Made books from Hawaiʻi. For more information please E-mail us! Recently we had the opportunity to compare the restored version next to an original 1912 "Gray" version of the book. Photo below was taken of the two books placed next to each other. © Timothy T. DeLaVega. Simple theme. Powered by Blogger.